Since there was a parade down Main Street, the police had to block off several side streets to through traffic. SIL was stationed near one of the roadblocks. Of course, someone drove around it. SIL repeated that it was illegal to drive around a roadblock. This exchange continued a few more times. Rules, apparently, were made for other people. SIL pulls over speeder in fancy Cadillac going 65 in a 50 mph zone. So the driver tries again. Of course, being the polite guy he is, he refrained from saying that. SIL had to regretfully inform him that there were a grand total of six signs bearing the 40 mph speed limit between the one highway that the driver exited and just before the other where SIL pulled him over. With good folks like these, I don’t think we need to worry about job security. police officers and firemen have the best stories! my brother-in-law is a fireman/paramedic, and he generally has new stories every time i see him! They sure do see it all. One call that he wasn’t on but heard about from another officer involved a very drunk and abusive obese woman outside the local McDonald’s. She was wearing a baby doll pajama top and thong underwear. Shudder…. Wonder if “Do you know my son-in-law?” would work. 🙂 Worth a try. Yikes! The McDonald’s disturbance calls for hazard pay. (MY EYES!!! MY EYES!!!) Maybe she was mad because she’d been rejected as a model for The Wal-mart People photos. “But I was in a hurry?” Obviously that person is used to getting their own sweet way. I have never had an experience with a policeman that was less than polite. I hate the sense of entitlement that some people have that lets them think they can get their own way. This is only the tip of the iceberg in entitlement thinking. Some people even try the old “do you know who I am?” line, but it gets them nowhere. 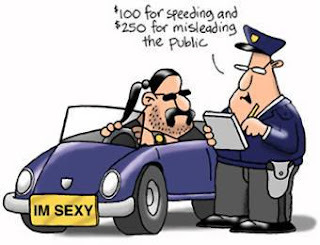 The real a**holes go to court to try to get out of a ticket, but they’re rarely successful. My SIL has to appear in court also, but it’s just part of the job to him. Oh my, the STORIES your son-in-law must have!!!! !